Shabbat Shalom! This week's Torah portion is Parashat Metzora, which continues last week's discussion of skin diseases and the proper way to purify oneself of these afflictions. Being that the Torah was written in a time before modern medicine, the cure for leprosy described in this parasha is to quarantine oneself for a time, then returning to the community to offer a sacrifice and be declared clean. The Torah recognizes that not all Israelites have equal access to the means with which to make the proscribed sacrifices. About halfway through this week's portion, the Torah spends a whole Aliyah describing the adjustments to be made for a person living with poverty. The word the Torah uses to mean “poor” (dal/דל) is a word that is often associated with “poor health” rather than poor funds, but then the verse continues, “And their means are insufficient…” and the next several verses suggest cheaper offerings for sacrifices. Many of the Rabbinic commentaries on this section point this out, ensuring that the readers in no way misunderstand the interesting choice of Hebrew word for “poor” here. The rabbis are clear that the Torah here is talking about accessibility for what passed for healthcare in that time for everyone, regardless of material wealth. Rabbi Elliot Dorff, a modern day halakhist for the Conservative movement, wrote in 2009 that Judaism supports universal health care. The value of saving a life and taking care of each other is consistent throughout Jewish texts and is a central Jewish value. It is further clear from Parashat Metzora that this does not just apply to life and death situations. Parashat Metzora makes clear that everyone must be able to obtain care even for dermatological issues, which may seem minor to today's understanding, and as the ancient Israelites understood the skin disease as reflective of social ills, then one could also extrapolate that treatment for behavioral health should be accessible as well. Rabbi Dorff suggests that there are multiple options for how universal healthcare could be provided and doesn’t advocate for any particular legislation in his ruling on the matter, but is adamant that a healthy society is one that is concerned for the health of all its residents, whether they can afford three lambs or one or maybe even merely two turtle doves. As modern day Jews, we uphold our Torah when we ensure that everyone in our community is properly cared for. Whether that means advocating for better and more affordable healthcare at a national level, or giving tzedekah to assist those without the means to cover their medical costs, or becoming healthcare professionals, as long as we are supporting each other's well-being, we are working toward building a healthy society, physically, mentally, and socially. May you always find the care you seek at a price you can afford, and may you ensure that those around you can do the same. Amen and Shabbat Shalom. Shabbat Shalom! This week's Torah portion is Parashat Shemini, a portion which I feel deeply connected to yet also continuously troubled by. It tells the stories of the sacrifices in the Mishkan. Aaron and his sons being freshly ordained, Moses walks them through the first official sacrifices, one of each sort described in Parashat Vayikra. After Aaron officiates all the correct korbanot, then two of his sons bring forth a “strange fire” and make an offering that was not commanded to the Lord. A different fire comes forth from the Lord and kills them. Some years I feel very sympathetic toward Nadav and Avihu. The Haftarah especially draws the emotion toward sympathy for the characters. The haftarah comes from II Samuel and it tells us of Uzzah, son of Avinadav (I don't think the similarities in the names is a coincidence), who reaches out and grasps the Ark of the Covenant to steady it as it the wobbly oxen transport it to King David's tower in the newly established capital of Jerusalem. Uzzah too is killed instantly by God for disobeying the commandment forbidding contact with the Ark, but if he hadn't the Ark would have fallen and the tablets may have been broken again. His death seems cruel and unfair, and so the deaths in the connecting Torah portion also seem extreme. However, in light of recent events, this year I am reading Nadav and Avihu as the extremists. Bringing an offering of unprescribed incense may not sound all that extremist, but the fact that they took it upon themselves to bring a gift for the Lord that was not asked for, instead of offering any of the number of sacrifices that were explicitly asked for, points toward zealotry. The jump from zealotry and presumptive over-enthusiasm in worship to religious extremism is not a far leap. In fact, 13th century French rabbi Chizkuni comments on Leviticus 10:1 that not only was this strange fire not asked for, God specifically commanded them not to bring it. Yet in their arrogance, they presumed to know the secret desire of God and brought this forbidden fire anyway. This calls to mind those who kill in the name of religion. If they kill because they believe their idea of God and faith to be the correct one, does that not violate one of the 10 commandments, “Thou shalt not murder”? If they kill because they believe those whom they target are members of a violent and dangerous religion, does that not violate laws of logic and country? These terrorists too act only out of their own arrogance, a presumption of knowing some deeper truth than the one that tells us we are all made in the Divine image and have an equal right to live with dignity and to worship freely without fear. I don’t wish death upon anyone else. But I hope that akin to the fire of the Lord that went forth and struck down Nadav and Avihu in their tracks, a Divine spark might strike people inclined to extremism such that they might awaken to the harmful reality of their rhetoric and actions and turn them from their paths before more they incite more violence. As human stewards of this earth, we can aid in this by spreading our own messages of peace and solidarity. May we stand together against hate and bigotry, and usher in a new world of acceptance and love. Amen and Shabbat Shalom. Shabbat Shalom and Chag Purim Sameach! Though tonight we are continuing the festive celebrations of the wonderful holiday of Purim, let’s not lose track of our Parashat HaShavua, which this week is Tzav. In this Torah portion, the priests’ duties, rights, and clothing are explained in great detail. It culminates with Aaron and his sons camping out in the Mishkan compound for a week for their ordination process. Each of us has our moment to shine, the opening at which we find our gifts, talents, privileges, power positions, connections, etc. are exactly what is needed to help people we care about, save a situation from disaster, boost up an issue we are concerned about. We must keep the fires of our passions burning so that we have the momentum, the awareness, of that moment when it is our turn to swoop in and save the day. May each of your find yourself with the burning fire of holy purpose to offer the sacrifice of your time and help those in need at just such a time as this. Amen, Shabbat Shalom, and Chag Purim Sameach. Shabbat Shalom. This week’s Torah portion is Parashat Vayikra, the first in the Book of Leviticus. It is pretty much all about animal sacrifices, and you’re going to hear a lot about that tomorrow from our wonderful B’nai Mitzvah twins. Tonight, I would like to tell you a little about the incredibly busy and fulfilling week I had. I spent considerable time Monday-Wednesday with colleagues from American Jewish World Service (AJWS). I was a Global Justice Fellow with them in 2014-2015, travelled to El Salvador and Nicaragua with them in January 2015, and attended a policy summit with them the following May, but this is the first time I’ve really gotten involved with them again since then. AJWS is primarily a grant giving organization that works with grassroots organizers all over the world in three main categories: civil rights and political freedom, land rights and food access, and healthcare rights, though sometimes there is overlap between those issues in the same community. Their main driving force is to identify the MOST marginalized in any given community and empower change makers from within the afflicted communities so that true equality and the dignity of human life might be achieved in even the darkest corners of a world full of troubles. Many of my colleagues who attended this convening with me are current Global Justice Fellows who have just returned from a trip to Guatemala. 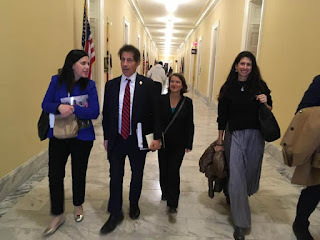 They shared their experiences with us in the space of the rabbinic convening, as well as with members of Congress and employees of the state department when we visited offices on Tuesday and Wednesday. As you may know, much of Central America is facing similar issues of destabilization and is still reeling with the echoes of the various civil wars and horrifying political violence from that spanned about 30 years in ripples across the region. Some countries, like Guatemala, have been on track in recent years to recover from that period of history but are now seeing fairly sudden backtracking of progress and justice. My colleagues’ trip to Guatemala was very much focused on AJWS's civil rights portfolio and how rule of law is deteriorating in Guatemala, while my trip to Nicaragua and El Salvador 4 years ago focused more on health for women, girls and LGBTI folks. 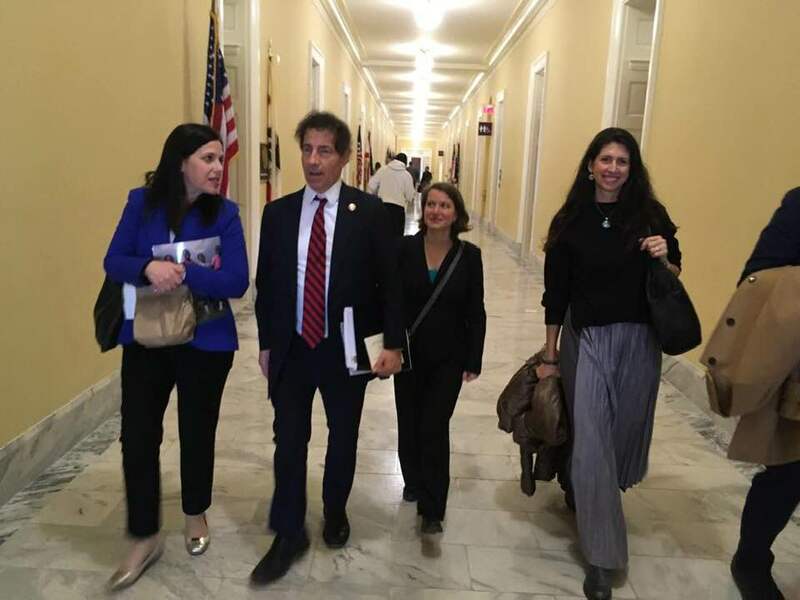 I learned a lot from my colleagues, and I also noticed how much overlap there was in our experiences with our visits to these Central American communities, and how pressing these concerns still are now as we take them to Congress to ask for US support for human rights around the world. For example, there is a bill currently on the floor in Congress to impose sanctions under the Global Magnitsky Human Rights Accountability Act to uphold and support the International Commission against Impunity in Guatemala, which the Guatemalan government is currently trying to undermine. The International Commission against Impunity in Guatemala, or CICIG, exists to serve as a third party impartial judicial body to work with the Guatemalan Judicial system to ensure corruption is kept out of legal proceedings so that justice and human rights prevails. This is the body that has allowed for the prosecution of many perpetrators of the genocide against the indigenous populations of Guatemala that occurred for much of the second half of the 20th century. Through these justice measures, CICIG has assisted in the democratic progress in the country as well. The current regime now wants to dismantle CICIG and pass an amnesty law that would set free the genocidaires, and put a great many people at renewed risk. As Jews, a people who have survived attempts at genocide and state-sponsored violence sometimes disguised as political necessity, we have a stake in genocide wherever it occurs. We have responsibility in ending it, investment in the justice and rebuilding that happens after, and interest in helping to prevent it wherever it seems likely to pop up again. Luckily, the Guatemalan Congress did not have a quorum to vote on their amnesty bill on Wednesday, so we have some time to take a breath and urge our Congress to pass our Guatemala bills currently in both the House and the Senate, and hopefully stay ahead of the possibility of coming atrocities in our neighboring nations. Aside from talking a lot about Guatemala (as well as Burma, and the Global Gag Rule), in preparation for and inside of our meetings with U.S. government employees, this convening of rabbis also, obviously, talked about Torah. One colleague shared a Midrash on the word Vayikra that opens our parasha. The aleph at the end of the word is written in tiny lettering in every scroll of Torah that has ever been written to our knowledge, but the reason why is not evident. One explanation is that Moses originally wrote “Vayikar”, to communicate that Moses simply happened upon God at the Tent of Meeting, as though neither Moses nor God had any great intention of continuing their talks from on the Mountain in the Mishkan. But God wanted Moses to come chat, wanted Moses to know that he was called upon, and wanted anyone else who should read these words to know that Moses was called. So the aleph was written in as a correction, and that scribal transmission has been passed down through the millennia. On the first afternoon of the convening, we were invited to turn to our neighbors and discuss what calls us to the work of social justice. Rabbi Jonah Pesner, director of the Religious Action Center of Reform Judaism told his story of taking the train from his apartment in lower Manhattan up to the Bronx for his high school, and seeing the devastation along the way, and feeling called to help communities in New York, and that was the beginning of his lifetime of community organizing and social justice leadership. He asked us what our story is, why we are AJWS rabbis. I couldn’t think of anything. If you ask me about my call to the rabbinate, I could give you some clear moments and pinpoint the origin of that call. But for me, the call to empathy is so innate, I couldn’t think of a story. I thought about the moments of re-awakening that brought me back into activism in 2015. I thought about the time I received a “Feed the Children” donation card in the mail, to my name, and I cried because I was about 8 years old and didn’t actually have any money of my own to feed the children, and I felt terribly guilty in my comfortable home with enough food to eat that I still couldn’t help others despite my own privilege. But neither of those experiences really felt like the origin story Rabbi Pesner was asking for. I thought, maybe I just happened into this. My parents are very generous and compassionate people. My grandmother wrote anti-racist poetry in the 1960’s. My great-grandparents escaped the Pale of Settlement when facing potential banishment to Siberia for actively working to take down the czar. Maybe this was just the camp I was born into. But two fairly long days later, hearing the midrash on the word Vayikra, I thought, maybe I can’t pin down an exact moment of awakening, but I was called into working for human rights and equality as assuredly as I was called to the rabbinate, and both are equally holy occupations. You may not be a rabbi, and you may not be an activist. But as a Jew, you too are called to Tikkun Olam, to repair the world, and as an American, you too have the right and privilege to use your moral imperative to sway our legislatures in matters of life and death for our fellow humans around the world. I urge you to use that call and that voice to make the world a better, safer place for everyone. May you find yourself called into Divine presence through holy work of peacemaking and justice. Amen and Shabbat Shalom.